Sunday fiestas here in Zihuatanejo are pure celebration. Music, dancing, food stalls, balloon sellers, they all mingle on the central plaza facing the beach. Last Sunday a stage was set up on the basketball court, and 30 or so dancers in elaborate costumes swirled and strutted through some fancy footwork, based on traditional regional dances. Meanwhile, vendors sold corn on and off the cob, tamales, popcorn, ice cream, enchiladas–the air was redolent with great smells. A clown ambled through with balloons. Off to one side, children bounced on a fenced trampoline. The plaza was packed with tourists and local families, out to enjoy the free open-air performances. And it happens almost every Sunday. We wandered happily among them, reveling in a kaleidoscope of sound and color. Most tourists to Mexico don’t bring school supplies along with their swimsuits and sunscreen. But we did, a big duffle bag full of crayons, markers, notebooks, pencils — all needed by the kids at Netza School in Zihuatanejo. The town nestles between mountains and the Pacific, on the west coast. We settled into our bungalow with a view of the bay, then hailed a cab and lugged the duffle up to the barrio. Netza is amazing. The school began with Marina Sanchez teaching kids under a tree and now it’s in hillside buildings for grades 1-6. These children would have no education without the Netza Project; they’d be selling trinkets to tourists on the beach. Many speak indigenous languages, not Spanish, and are too poor to buy uniforms and books required by state schools. An American, Lisa Martin, spearheaded its growth in 3 Cups of Tea style. So here we were, waving at little kids, listening to their songs and lessons, and delivering the things we and several friends collected. Back on the beach, hanging out at a cafe that plays great jazz CDs, we watched the waves roll in and felt we’d done something worthwhile. We prowled the gritty streets and alleyways of San Francisco that Sunday, searching for an infamous black bird, or at least the ghost of Bogey. 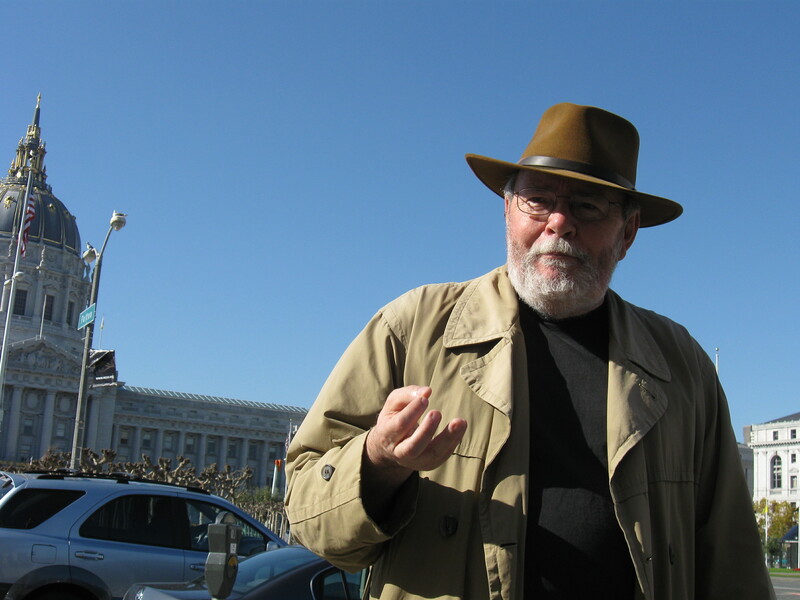 Don Herron led the way, in his snapbrim and wrinkled trench coat. 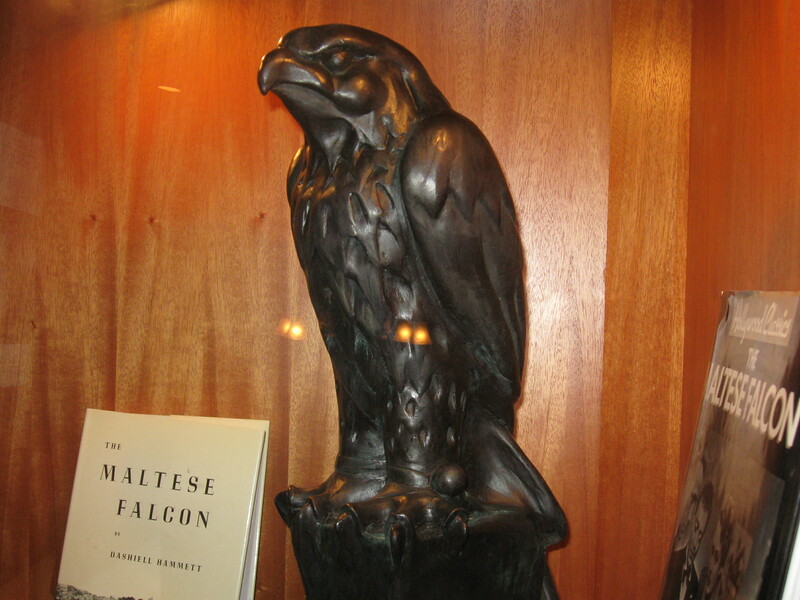 We never found the Black Falcon, though we saw a replica in John’s Grill, but we felt a few ghostly shivers and learned a lot about Dashiell Hammett and his noir detective stories set in The City By The Bay. Well, Don ought to know every detail of the author’s life and books, he’s been doing this tour for 33 years. We paused for a beer during the 4-hour walk, in a bar with ripped vinyl stools and photos of boxers on the walls. Very Continental Op. Later we saw the alley where Sam Spade’s partner, Miles Archer, met his end in the night fog, betrayed by a treacherous dame. The tour cost a measly tenspot, worth every cent. Next time I’m wearing a cool ’40s hat.